The 2017 TN Naturalist classes at Cedars of Lebanon begin Saturday, 14 January and continue on the second Saturday of each month through 09 December for a total of 12 classes. Participants will complete 40 hours of classroom instruction and fulfill 40 hours of volunteer service to receive the Tennessee Naturalist Program certificate. Classroom topics cover various aspects of Tennessee’s natural history including Tennessee Ecology, Geology, Aquatics, Birds of Tennessee, Astronomy, Mammals of Tennessee, Invertebrates, Tennessee Forests, and Ferns, Forbs & Fungi, among others. Graduates from the course will join a group of TN Naturalist volunteers that provides education, outreach, and services dedicated to educating others, understanding, and benefiting Tennessee’s natural areas. 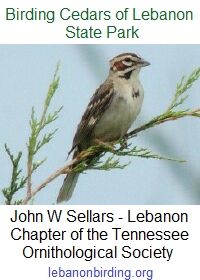 This entry was posted in Announcement, Public Notice, Tennessee Naturalist and tagged Cedars of Lebanon State Park, friends of cedars of lebanon, Lebanon TN, tennessee, Tennessee Naturalist Program. Bookmark the permalink.